Ummu Sa'eed RA says: "I once saw a very deep cut on the shoulder of Ummu Ammarah RA. I asked her how she had got that. She said, 'I got it in Uhud. When people were running about in confusion, I saw Ibn Qumiah coming towards us and shouting, 'Where is Muhammad !. Let somebody tell me about his whereabouts. If he is saved today, I am no more.' I, Mus'ab bin Umair and some others stopped him. He gave me this deep cut on my shoulder. I also attacked him, but he escaped because of the double coat of armour that he was wearing." I attacked his horse from the back and cut its leg. This caused the horse as well as the rider to fall on the ground. As soon as this happened, Nabi SAW would shout to my son, who would run to my help and then we both finished the man in no time." Her son Abdullah bin Zaid RA says: "I had a wound on my left arm, which would not stop bleeding. Nabi SAW said to my mother, 'Put a bandage over it.' My mother took out a bandage from her belt and after bandaging my wound, said, 'Now, son! Go and fight again with the idolaters.' Nabi SAW was watching us. He said, 'O, Ummu Ammarah RA, who can have courage like yours?" At that time, Nabi SAW prayed again and again for Ummu Ammarah RA and her family. 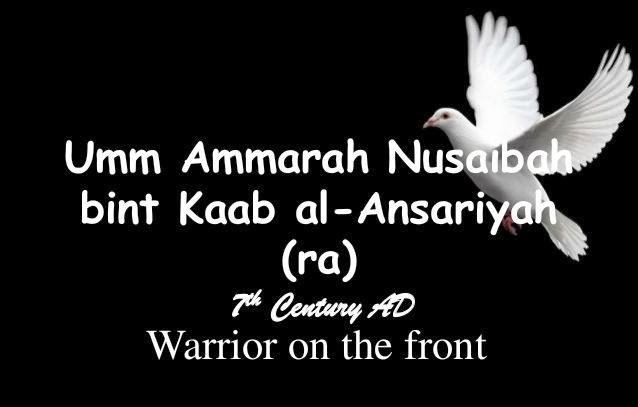 Ummu Ammarah RA said, "I was standing with Nabi SAW when one of the enemies passed by in front of me. Nabi SAW said to me, 'UmmU Ammarah! He is the man who wounded your son.' I jumped at him and hit his leg. This caused him to fall down. We then went forward and finished him. Nabi SAW smiled and said, 'Ummu Ammarah RA has taken revenge for her son,' When Nabi SAW was praying for us, I said to him, 'O, Nabi of Allah! Pray that I may join you in Jannat.' He made this prayer too. After this I cared very little for any difficulty that came to me in this life." The typical Muslim woman, shrouded from the world, lives her life in obscurity in the service of her husband and children. Seeking no recognition and having no personality or ambitions beyond the pleasure of her family she lives and dies leaving no mark on the pages of history. She is of course oppressed, neglected and possibly abused. That's how the mainstream media of the western world degrade the role of Muslim women for many decades. The location where the Aqaba Pledge took place and the Aqaba Mosque and Ummu Ammarah RA is one of the two female Ansari. Umm Ammarah RA, may Allah be pleased with her, was a woman of exemplary courage and her life carries so many lessons for us. I have shared a few that I learned to know of.